Soul Food for Hungry Young Adults! September 30th 2012. Today’s ‘Soul Food’ reflects on the Gospel for Sunday 30th September, the 26th Sunday in Ordinary Time: Click on Mass Readings on Homepage, and on Sunday Readings, for text: St. Mark, Chapter 9, verses 38-43, also verse 45, verses 47-48,- or find it in your own Gospel of Mark. 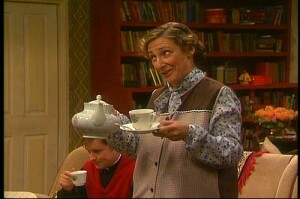 ‘WILL YOU HAVE A CUPPA ?’ Mrs. Doyle, in Fr. Ted – ‘ Ah go on, have a cup, you will, you will, you will! ‘ . Isn’t it great to give someone a cuppa, or even a cup of water, when thirsty. When you’re kind to another human, you’re kind to their Maker. But Jesus is correcting us: ‘Don’t stop them if they are doing something good, – even if it’s only giving someone a glass of water to cool their thirst. They mightn’t be one of YOU or your lot, but they certainly belong to me, if they act like that. Just because they are different from you doesn’t mean they don’t belong to ME. Stop excluding people who are different, who are not following YOUR crowd. 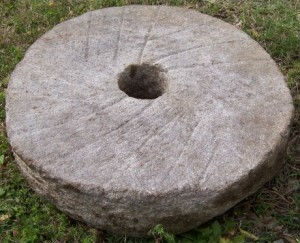 OF MILLSTONES AND THE SEA: here is a very tough saying, one of the toughest images Jesus ever used. Jesus doesn’t put a tooth in it! He uses a very powerful image to speak a very powerful truth:- don’t even think of harming another person, little or big. What you do to another human being, you do to me! And if you cause somebody to lose faith, if your life is an obstacle to them, then let me tell you that it’s mighty hurtful not only to them but to me! To harm another like that, to cause somebody to stumble,- well, let me tell you it’s serious! And to impress on you (says Jesus) how wrong it is, let me use this image, he says: someone who does it deserves to be thrown into the sea with a great millstone around his or her neck! Sorry to be so blunt, he says, but I need to impress this deeply in your heart and community,- harm another, and you harm God! Your heavenly Father identifies with every human being on the planet,- whether ‘one of yours’ or not. Remember this: every one is the Only One, before our Maker. And Jesus might even take that line from Mrs. Doyle: ’Ah, go on, go on, go on!’- love one another, the way I have loved you’,- ’this much’, as he stretches his arms wide between heaven and earth and pours out his love for us and on us- ALL of us. God bliss you and bless you, Sinead, Mark,- thanks for taking the time to read this. Have a great week. Walk close to the Master.